You want to keep your baby safely on one side of your gate, but how do you do that without greatly inconveniencing everyone else in the house? Use a baby gate with a door of course! The North States Portico Arch Gate is the top rated baby gate with door on the market today. It is stylish, not too expensive, and the door swings fully open both directions with just one hand. The hold open feature lets you keep the door open when you need to, and the gate itself pressure mounts without any hardware. With the exception of retractable baby gates and some of the cheaper wooden or mesh gates, most baby gates today come with a door that lets adults and other youngsters in the house pass through. But just like not all baby gates are made equal, neither are all doors made equal. Some require two hands to open, while others require one. Some have nifty extras like a stay open feature or childproof lock. Some are better quality, while others are better value. On this page we compare some of the best models available in the hopes of making it easier for you to pick the best baby gate with door for your home. We examine some extra wide gates with doors, some standard sized, and even a baby gate with a pet door inside the human door. Before we examine any of these in more detail though, let’s first take a look at a quick comparison of all the best baby gates with doors on our list. Hopefully the comparison chart above was useful in getting a quick sense of which baby gate with door might be the best option for your home, but let’s move on to look at a few of our favorites in more detail. If you’re looking for the best baby gate with door and you are enclosing a somewhat standard size door frame, there’s really no beating the Supergate Portico Arch Gate by North States. All of the North States baby gates are quality made using metal that feels heavy-duty, and have an added elegance with their matte bronze finish (or neutral linen, if that fits your house better) and arched pass through door. And you don’t pay very much extra for that quality and style, as their prices are all right in line with those of the comparable gates. The Supergate Portico Arch Gate fits most spaces between 28.25″ and 38.25″ and comes with two extension frames that help you get the right fit in your doorway. You can use the gate with neither, one, or both of these extensions, and then use the screw knobs to tighten all the way until the pressure against the door frame holds the gate securely in place. The door on this baby gate is really great. It opens and closes with one hand, it swings fully open in both directions, it has a hold open feature that keeps the door open for an extended time, and it has a triple-locking system for extra security. If your child is getting older and has figured out how to open the door, just twist the lock on top of the door to keep it locked shut (see picture at right). You can untwist it and still open the door with one hand when needed. The North States Supergate receives really great reviews from consumers, and even many customers who have tried and tested multiple baby gates have said that this is the best one by a fair margin, a really strong endorsement. 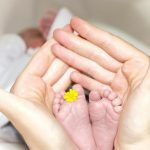 For many parents, a baby isn’t the only little member of the family. And when you want to keep the baby contained safely in one area, that can be an inconvenience to your pet, who’s old enough to roam the house on his or her own. The solution? A baby gate with a pet door. The top rated and best selling baby gate with pet door currently is the Carlson Walk Through Gate With Pet Door. It’s made from a sturdy steel and has a 10x7 inch pet door inside of a normal human-sized pass through door. That’s just the right size for a cat or the smallest of dogs to easily climb through, while larger pets, small children, and babies (hopefully) cannot. However, some customers have reported that their babies have figured out how to open and crawl through the cat door, although it has a pin lock that can be used to keep the cat door closed. The Carlson Baby Gate With Cat Door is marketed as an extra wide gate and fits spaces 29 inches – 44 inches wide. Another thing to keep in mind is the space in between the metal slots are 2.5″ wide, with the exception of right by the door where they are 3 inches wide. Some small cats can also slide through here, but that’s usually okay if you’re using the gate to let your cats through anyway. 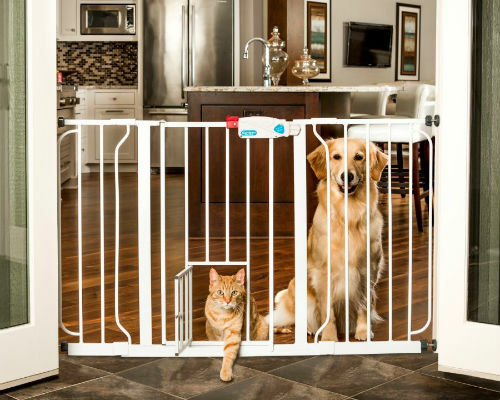 Overall this is a really popular baby gate with door among pet owners, due to its high quality, small cat door, and low price. But it’s not the only pet gate around. For more information on pet gates, check out our detailed sister site PetGatePro.com. See full customer reviews and prices of this model on Amazon. Sometimes a standard size gate just won’t work, and fortunately North States makes an extra wide version of their arched baby gate with door, the Supergate Deluxe Decor Metal Gate. Unlike their standard version, it does not pressure mount but rather requires a bit of included hardware to keep the wider door sturdy. It does have a really nice design though, as to fit the gate inside of your space you simply need to pivot the sections on either side of the door at an angle until it fits snugly. There’s no sliding or expanding pieces, it’s all a matter of using diagonal lines to shorten the width. The result is actually quite an elegant arched shape to the overall gate, which can be used in spaces between 38.3 and 72 inches. The door on this metal gate is a nice extra-wide 25.5 inch door that easily opens with one hand. 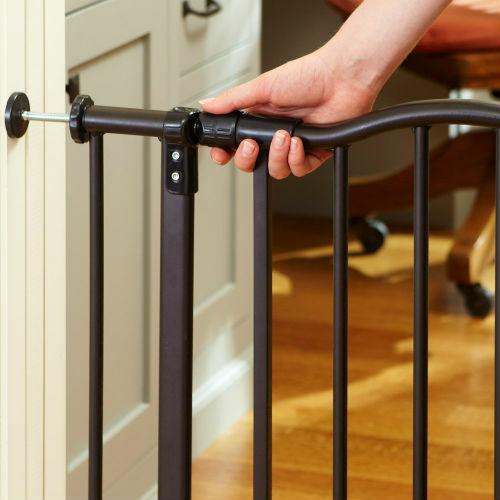 It has the same stay-open feature as the North States standard size baby gate with door, and has gotten good reviews for being convenient to open. It also comes in a matte bronze or neutral linen color, and as far as extra wide baby gates with doors go, is a really great option. If you have a space that is larger than 72 inches or would like to check out more extra-wide gates, check out our page comparing the best extra wide baby gates. Want To See More Baby Gates With Doors? If you didn’t see quite what you were looking for here, check out our article on walk through baby gates to see more convenient options.